We’re performing maintenance on both a Craftsman 6.5 horsepower (HP) self-propelled mower, and a lighter duty 4.5 HP Murray mower. Both push mowers are powered by Briggs & Stratton 4-cycle engines. For this article, we’re only going to show the sharpening process on the Craftsman, but the principals can be applied to all mower blades. 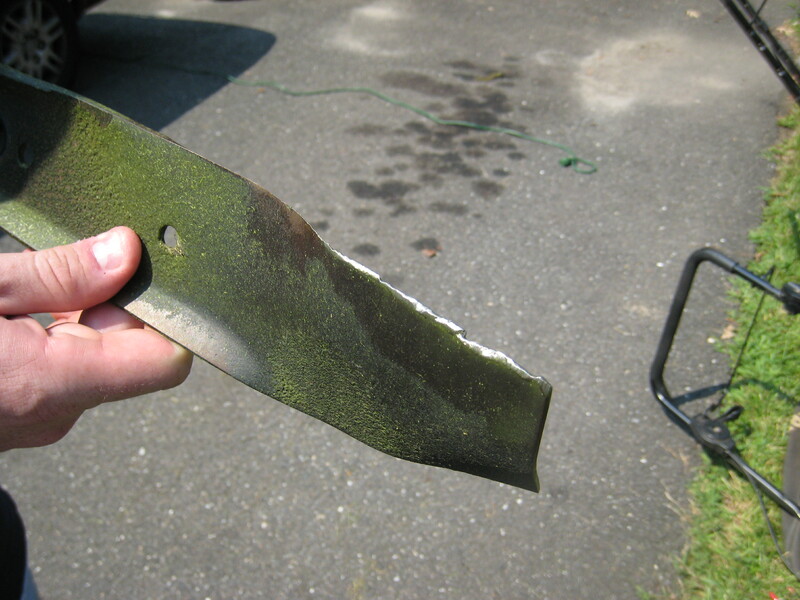 Properly maintaining your lawn mower blade is important. A sharp blade ensures that grass is cut (rather than torn) evenly and on the first pass, and the engine won’t have to work as hard. Step 1: Disconnect the spark plug to keep the mower from accidentally starting. The spark plug is connected to a wire and is usually located on the front of the engine. Simply pull the wire off the spark plug to disconnect it. Step 2: Tip the mower on its side. It’s best to have an empty gas tank but not necessary (in my opinion). Tip the mower keeping the air filter up to avoid oil seeping into the air filter compartment. Step 3: The blade will be secured by a nut (typically standard thread). Turn it counter-clockwise to loosen. Some mowers will have overlapping holes used to lock the blade in place. Find something like an old screwdriver and insert it into both holes. The nut will be very tight so be prepared to use a little elbow grease. I used a hand-held grinder but the basic principals can be applied to a bench grinder too. Step 5: Secure the blade with some kind of vise or clamp. Be aware of your surroundings as lots of sparks will occur when you start sharpening. This step is best performed outside. Be particularly aware of any sawdust or combustible materials that may be in the line of the sparks, as these could ignite. Step 6: Run the grinder along the blade with smooth even movements. Make sure the grinder is spinning toward the cutting edge. Follow the manufacturer’s bevel as best you can. The end result should be a balanced blade. If not, the blade will not cut evenly, and the mower will vibrate which can damage the mower engine. Step 7: To check the balance, partially drive a nail straight into a stud. Hang the blade on the nail to see if one side dips lower than the other, and grind the heavy side until the blade is balanced. Step 8: Re-install the blade on the mower ensuring that all washers and nuts are installed in the same order they were removed, and that the final nut is tightened. Start the engine. If the mower runs smooth, you’re done. If the mower shakes or vibrates, either the blade is unbalanced (see Step 7) or it has not been installed properly. Track back through these steps to ensure you did everything right. Check back as One Project Closer will have more DIY maintenance posts to come. What do you think? When was the last time you checked your mower blade? I used to do this the old fashioned way, with a file! Now I use a bench grinder. @thefencepost, I used a file the first time. Never again! Glad you liked the post. Every step was right on except one very important one. When tighting the bolt it MUST be torqued to a certain ft lb. Usually 30 ft lbs. I just dont want to see anyone get hurt. Just to let you know. Thanks for the guide, now I don’t have to pay the shop to sharpen it. I was thinking the bolt holding the blade on the B&S was a ccw bolt and needs to be turned clockwise to tighten. I’m having trouble getting mine off and so was looking for clarification. I’ve tried turning it both ways. Any time you’re sharpening a blade of any type- be it an axe or lawnmower or anything else- DO NOT use a grinder. Grinders produce way too much heat, and ruin the temper of the blade. What you end up with is a blade that will dull and chip way easier. It ruins the blade. 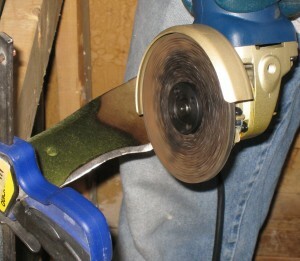 A file, while time consuming, is the proper way to sharpen lawn mower blades. It’s also the best way to keep from removing too much material from the blade. Grinders move fast and eat a lot more metal than a file. You’ll find yourself going through blades much faster simply because one sharpening removes a ton of material. The 2-3 sharpenings per blade count is far too low. With a file, you can get a bajillion sharpenings, because you’re only removing enough material to sharpen the blade. If you absolutely can’t use a file, an angle grinder with an abrasive flap disk is better than a grinding wheel. It still gets the metal hot, but not usually enough to take the temper out. I sharpen my blades every cut, but I like to have a sharp blade. Sharp blades cut the grass, and dull ones rip the top off, which makes the rough edge of the grass turn brown. I have a Honda mower that can use mulching blades or high lift blades. I use high lift on my front yard when I need to bag, and mulching the rest of the time. Great comments William! I hadn’t considered the temper of the blade. 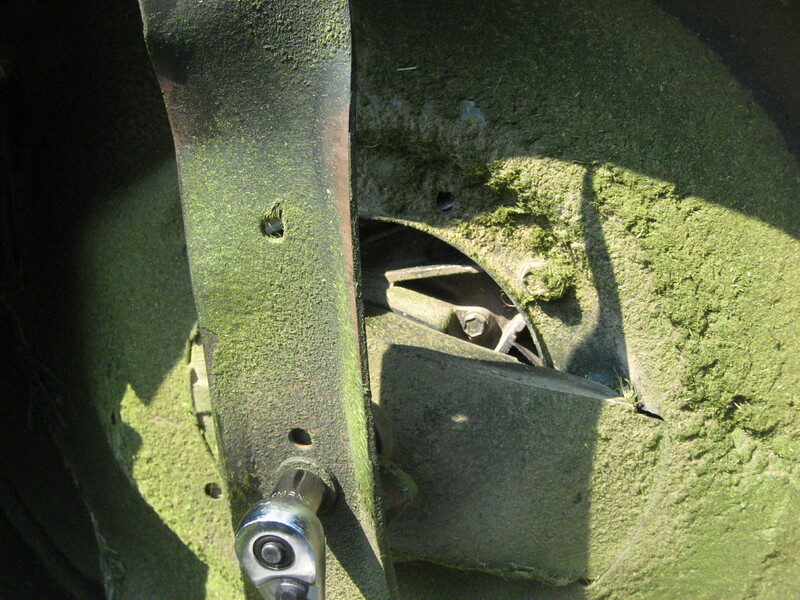 A lot of people still recommend a grinder, especially because mower blades can become so pitted that using a file to remove them would be very time consuming. Next sharpening, I’ll use a metal file and compare how long it lasts. The sharpness won’t last any longer. The overall life of the blade will be much longer, because you’re removing far less metal. Just put the blade in a vise and go to town. I still don’t have a bench or vise, so I use a clamp and clamp the blade to a wood shelf at the right height for working. If you’ve ever taken your blade to get sharpened, or used a grinder to sharpen it, you might notice two things about the shape of the edge after that. 1) the grind of the edge is concave. This leads to a thinner edge that chips, gouges, and even cracks (especially after temper is lost) far easier. The edge should be a flat bevel ideally, but convex is okay if you’re not great at attaining a flat cut with a file. 2) the blade has more metal removed in one spot on the length of the edge than the rest. This can show as the end of the edge curving back toward the back of the blade, or it can show as the middle of the edge curving in toward the back of the blade. The entire edge should ideally be parallel with the back of the blade, except in the case of dual blade setups where the top blade is often tapered toward the ends. In that case, you should try to maintain the straight edge at the same angle. I found out that some generic blades to ” fit all” don’t, when it comes to the ” overlapping holes to secure the blade”. I have a Craftsman mower with 190 cc Briggs & Stratton engine. The plate surrounding the motor shaft has two small projections, one to each side of the shaft, facing the ground. When you mount a new blade, MAKE SURE those projections line up well and fit into any holes or slots designed for them. If they don’t, the blade will probably slip some, and you’ll hear a clunking metal sound as those projections spin around, hitting the top of the blade they should have been imbedded in. The sound is a bit scary, especially since you don’t want to think about the blade flying off. Glad I figured that out. I need to change the blades but don’t know which way to turn to get them off on ether side? 40″ deck and not sure which way to turn the nuts to take the blades off? I’m 88 and for at least 20 years I’ve been sharpening mine in place. I do this by turning the mower on it’s side, disconnecting the plug, ( ESSENTIAL) then sharpen them with my 100 mm angle grinder. I do a little on each one at a time to avoid the friction heat. They seem to last well for me? I removed the blade from my self propelled craftsman, took it to local hardware to fro sharpening. After I replaced the blade, the self propel doesn’t work. I did have to replace the belt onto the unit that holds the blade. What happened and how can II fix this? Great article coming into spring! Everyone seems to be getting their grass cut at the moment and it makes me smile! For me, its the first sign that summer is coming! role on the warmer weather. A lot of our resin driveway contractors are landscapers. Keeping them informed of tips like this is crucial. Will make sure they check their mowers more often. Thank you!